This is the terrifying moment a cement mixer truck overturns and hurtles down a road in a shower of sparks – stopping inches short of another car. The footage, taken in Jiangjin, south-west China, captures the view of a Honda driver as he travels down a narrow road in thick fog. 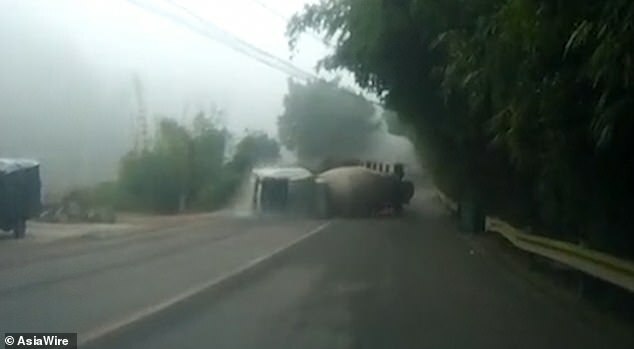 Ahead of the motorist, a cement mixer truck appears, and within seconds falls onto its side across both lanes of the road. Its windscreen shatters as the vehicle begins sliding uncontrollably towards oncoming traffic – sparks flying as it moves. The Honda driver then hits the brakes and begins honking his horn as the truck hurtles towards him. The cement mixer then twists again on the road, spinning around entirely before stopping just before the SUV. 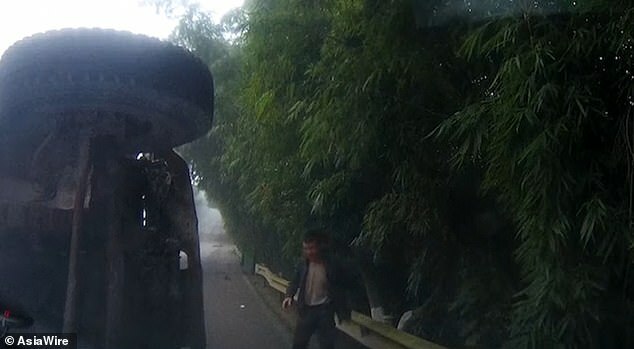 The dazed lorry driver can then be seen climbing out of the cabin as the video ends. It is believed neither of the drivers suffered injuries following the accident. Photographs from the scene show just how close the two vehicles came to colliding, with one of the lorry’s wheels resting underneath the SUV’s front bumper. Authorities said the lorry driver failed to slow down when travelling downhill and ended up losing control, overturning and sliding more than 130 feet.